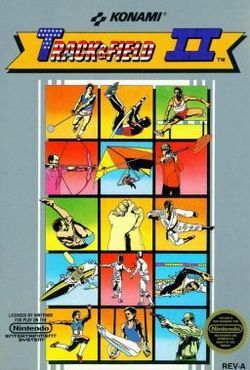 Track & Field II (known in Japan as Konamic Sports in Seoul) is a sequel to Track & Field created by Konami for the NES in 1988. It continues the Olympic-themed sports events, but adds more realism by allowing the player to choose a country to represent. The game boasts 15 sporting events, with two of them available as bonus stages between rounds of the "Olympic" mode. As the Japanese title indicates, the game is based on the 1988 Summer Olympics in Seoul, South Korea, hence the introduction of Taekwondo (a Korean martial art) as one of the events. The game is commonly cited for its difficult game play. Many events require players to build up a power meter in order to successfully compete against opponents. Players build this meter up by rapidly pressing buttons on the control pad. However, the speed which is required to fill the meter is often too difficult for human players to accomplish. Thus, players often feel the need to resort to methods such as using a Turbo fire button just to succeed at playing the game. This page was last edited on 6 September 2014, at 03:43.